Do you need a comfortable shoe that gives a professional look? Or do you simply want something stylish that will go well with any casual or semi-formal attire? Let’s show you the different options on how to wear chukka boots. Chukka boots are a versatile style of men’s wear, and they can be used for far more than what they might otherwise be known for. Get yourself a pair of comfortable chukka boots and you will never be disappointed. You won’t be wearing Chukka Boots for a spacewalk, to run a marathon, play a game of soccer, or to ballroom dance. So what are they? Chukka Boots are a casual and business casual style of shoe. Suede chukka boots are perfect for that classic, comfortable look. 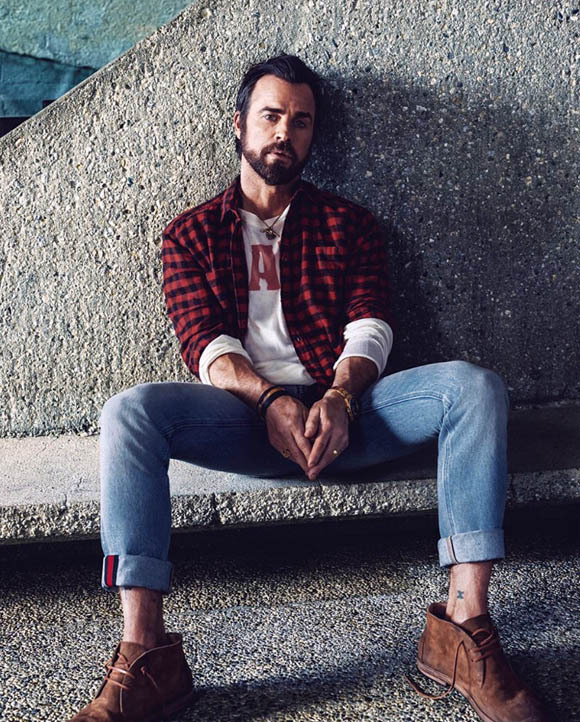 Leather chukka boots have a more formal sensibility; while still being comfortable and great for a chukka boots with jeans look that emphasizes style with a traditional, casual appearance. While they’re similar in appearance, desert boots are a very specific style of chukka boots, worn by the British in World War II. The chukka boots of today use sturdier construction material, including rubber soles as opposed to the flimsier crepe rubber soles of desert boots. 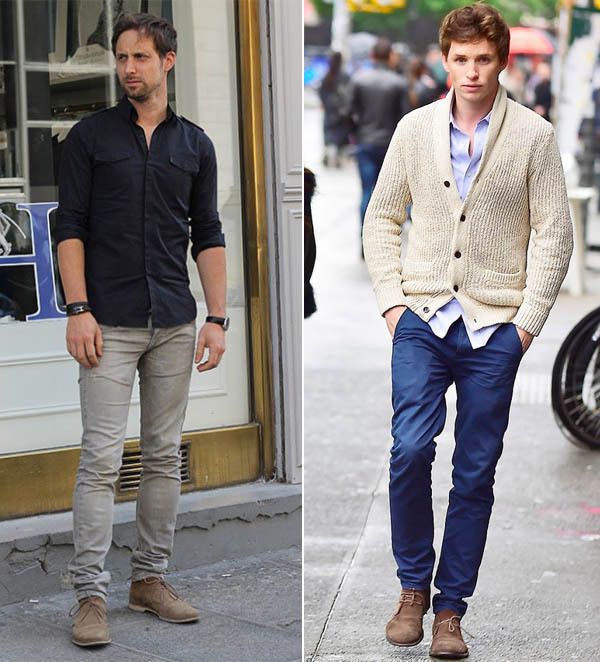 Below are some styling tips on how to wear chukka boots. 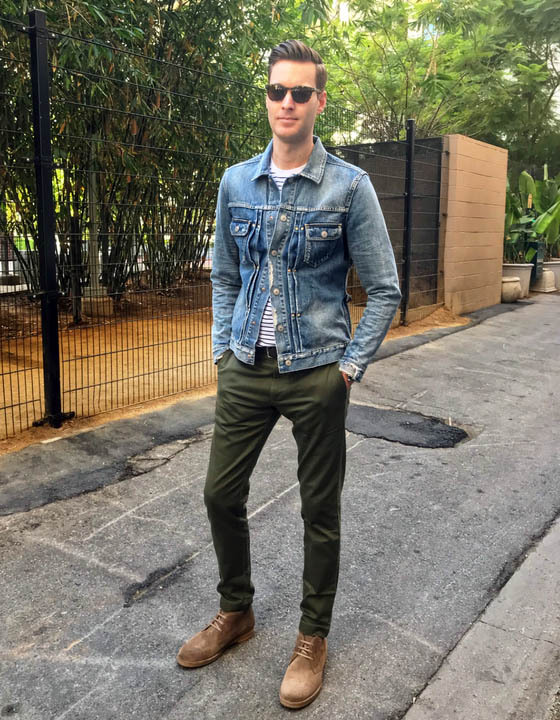 A very standard, casual look for most men includes jeans. 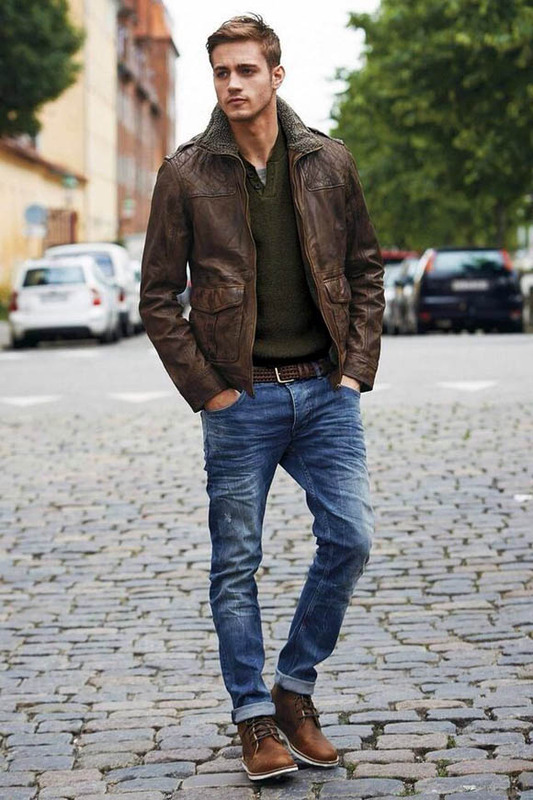 Rugged and comfortable, modern jeans are available in many different colors and styles. The rough-and-tumble look is complemented perfectly by a pair of comfortable chukka boots. With this classic pairing, one can be stylish, while showcasing a practical sensibility. You can take comfort in knowing that comfort is the goal of a pair of suede chukka boots. Nearly as durable as traditional leather, the soft feel of the specially treated, reversed leather hide is used to strike the perfect compromise between feel and function. 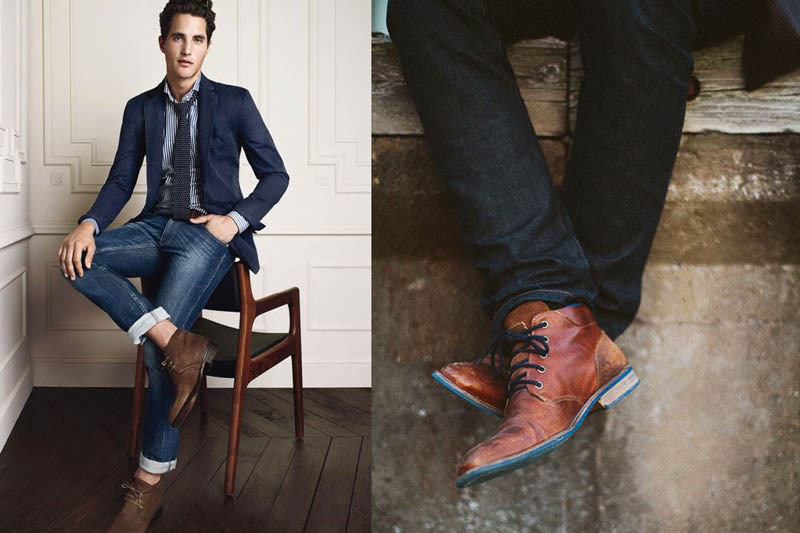 A variety of men’s fashion choices, not just jeans, will pair well with these casual boots. When you still want casual comfort, but with a classier sense of style, leather chukka boots are the perfect choice. With the smooth, glossy exterior that one expects from leather, these chukka boots offer a dressy style that is great for business casual, while still able to hold a comfortable, classic casual, albeit snappier, look as well. 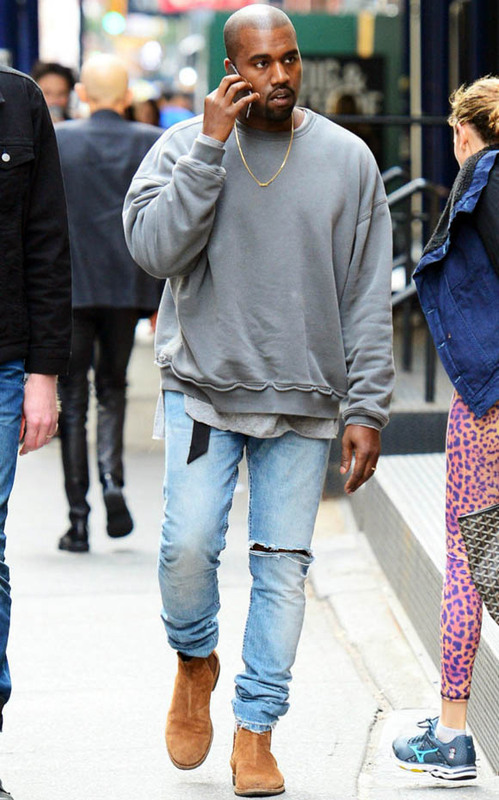 How to wear Chukka Boots? That’s entirely up to you! The style flexibility, the quality of the material, and their popularity make chukka boots a great pick no matter what your needs are. A pair of comfortable jeans, a shirt, and a pair of chukka boots and you’ve got a classic casual look. A pair of brown suede chukka’s work just as well as a pair of black leather chukka’s with any brand or style of jeans. If you’re more fond of cargo pants, chukka boots suit them just as well. But your chukkas can also pair easily with khakis, chinos, or even a more formal style of trousers. Whether you’re relaxing on vacation, or you need something casual for work, the right pair of chukkas will make for the perfect match. When people talk about the right shoe for the right occasion; many shoes are often limited to singular occasions, but chukka boots are truly suited for most. The answer to the question of “how to wear chukka boots” is a simple one: any way you want. Craft your own style using any of a number of different chukka boots to suit it. While they won’t replace hiking boots, chukka boots are durable enough to handle natural terrain; and so they can just as easily fit in the woods as they can on a street sidewalk or the hard carpet of an office floor. There’s nothing stopping you from wearing chukka boots the way you want. Furthermore, if you’re going to invest in a quality pair of chukka boots, you’re going to have to care for them. Though a quality pair of chukka boots will be plenty durable, proper maintenance will allow you to wear them out properly, letting you enjoy your favorite pair for years to come. Chukka boots made of leather are much easier to maintain. Quality leather isn’t stained by much, so regular wipe downs and shoe polish should keep them snappy and classy. Suede boots need a little bit more love, due to their nappy nature. To clean your suede boots, stuff them with paper. This will give the shoe its full shape, allowing you to brush off the dirt. Then you’ll want a suede eraser or, if you don’t have one or you need something a bit tougher, a nail brush will work. Once the dirt has been removed, you can take a brush to the suede again and gently comb through the suede to return it to its nappy, natural beauty. Finally, if you’ve chosen to invest in it, use your suede protector. Just spray and dry. That’s all you need to do to make sure your chukka boots stay with you for a long time. Chukka boots are comfortable, casual, and classy. They’re a versatile, ideal men’s shoe. If all you know of chukka boots are their desert boots counterpart, then it’s time you take another look. 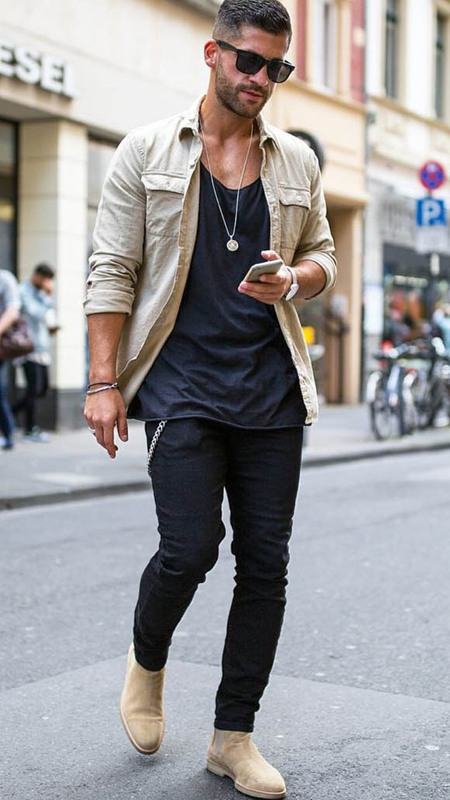 Some final notes include: try chukka boots with a light color and/or made of suede for a casual look; for more formal styling, look for chukka boots made with leather in darker shades; wear a t-shirt or a homey button-down and jeans or cargo pants for a casual look; if you want to wear chukka boots to the office, pair them with a pair of nice trousers. If you want a shoe that can do the most, then it’s time you considered getting a pair of chukka boots. You won’t be disappointed that you did.